(Nanowerk News) In another demonstration that brain-computer interface technology has the potential to improve the function and quality of life of those unable to use their own arms, a woman with quadriplegia shaped the almost human hand of a robot arm with just her thoughts to pick up big and small boxes, a ball, an oddly shaped rock, and fat and skinny tubes. Using mind control, a woman with quadriplegia moves robot arm and hand in. The findings by researchers at the University of Pittsburgh School of Medicine, published online today in the Journal of Neural Engineering ("Ten-dimensional anthropomorphic arm control in a human brain-machine interface: difficulties, solutions, and limitations"), describe, for the first time, 10-degree brain control of a prosthetic device in which the trial participant used the arm and hand to reach, grasp, and place a variety of objects. "Our project has shown that we can interpret signals from neurons with a simple computer algorithm to generate sophisticated, fluid movements that allow the user to interact with the environment," said senior investigator Jennifer Collinger, Ph.D., assistant professor, Department of Physical Medicine and Rehabilitation (PM&R), Pitt School of Medicine, and research scientist for the VA Pittsburgh Healthcare System. Controlling the robot arm with her thoughts, the participant shaped the hand into four positions: fingers spread, scoop, pinch and thumb up. In February 2012, small electrode grids with 96 tiny contact points each were surgically implanted in the regions of trial participant Jan Scheuermann's brain that would normally control her right arm and hand movement. 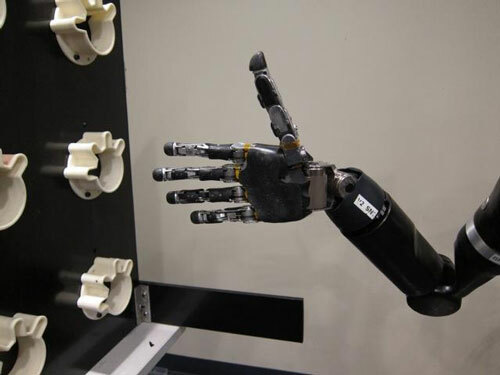 "In the next part of the study, described in this new paper, Jan mastered 10D control, allowing her to move the robot hand into different positions while also controlling the arm and wrist," said Michael Boninger, M.D., professor and chair, PM&R, and director of the UPMC Rehabilitation Institute. "Jan used the robot arm to grasp more easily when objects had been displayed during the preceding calibration, which was interesting," said co-investigator Andrew Schwartz, Ph.D., professor of Neurobiology, Pitt School of Medicine. "Overall, our results indicate that highly coordinated, natural movement can be restored to people whose arms and hands are paralyzed."